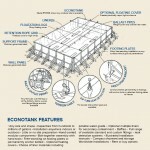 EconoTank - Engineered for Lowest Containment Cost | ModuTank Inc.
EconoTanks offer versatile liquid storage for environmental, industrial, commercial and agricultural use, including chemical, potable and wastewater storage. The 4’9” high EconoTank is available at per-gallon containment costs below those of other storage systems. Modular EconoTank components, engineered for hand-carrying and rapid bolt-together assembly by workers using common hand tools, sharply reduce installation costs. Also, no special skills, cranes, welding or scaffolding are necessary. Shipping charges are minimized through efficient, compact packaging of modular components on skids sized for flat bed shipment. For example, the steel for a 2,000,000 gallon EconoTank can ship on a single flatbed. Additional cost savings can be realized through Modutank Inc’s. Rental Agreement (see Rentals). EconoTanks are economical alternatives to standard tanks, lagoons, ponds and fractanks. Econotanks are available in capacities from hundreds to millions of gallons in rectilinear sizes from 8’ x 8’ upward based on 4’9” high x 3’9” wide modules. Special shapes with right angle corners such as “L”, “U”, “T”, etc. (see Custom Tanks) are possible to meet site or special flow requirements. Free-standing EconoTanks install on any firm, level surface with little or no site preparation utilizing our anchor plate and above-ground ballast system for short-term installations or where ground penetrations are not desirable. Alternatively, EconoTanks can be anchor bolted to concrete foundations for permanent installation. Floating covers fabricated from the same flexible membrane materials as liners are available as options for creating totally enclosed systems. Covers, buoyed up by floatation logs, ride on the fluid’s surface and create practically vapor-tight enclosures. Insulated floating covers are available. Wall panels are 16 ga. G90 mill galvanized steel. 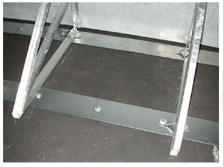 Support frames are fabricated from 2” x 2” x 1/8” and 3/16” steel angles and hot dip galvanized. 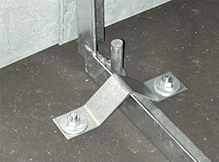 Wall braces are 2” x 2” x 1/8” galvanized steel angle. Footing plates are galvanized or cor-ten alloy steel. Tension cables are galvanized steel. Stainless steel cables are available. Hardware is plated steel. A 20 mil laminated polyethylene liner and 8 oz. geotextile ground cover is standard. Other liner materials are available.